Well Go USA recently send us information for their latest release "The Adventures". The film stars Andy Lau (House of Flying Daggers, Internal Affairs), Jean Reno (Leon: The Professional, The Da Vinci Code, Mission Impossible), Shu Qi (The Transporter, The Assassin) and Zhang Jingchu (Mission: Impossible - Rogue Nation). Special features on DVD and Blu-Ray includes a three part making of featurette. 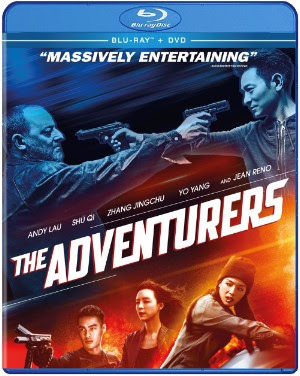 "The Adventures" hits VOD on December 5th and DVD and Blu-Ray on January 9th. Hong Kong Superstar Andy Lau (House of Flying Daggers, Internal Affairs) as a charismatic thief is pursued by French icon Jean Reno (Leon: The Professional, The Da Vinci Code, Mission Impossible) as a tenacious detective in the globetrotting caper film THE ADVENTURERS, stealing onto on digital December 5 and on Blu-ray™ Combo Pack January 2 from Well Go USA Entertainment. Infamous thief Cheung Tan (Lau) has recently been released from prison. Cheung immediately plots a heist with his partners in order to steal precious jewels in Europe. Meanwhile, French detective Pierre (Reno) has been hot on Cheung’s trails for many years. This time, he decides to capture Cheung and his gang of thieves for good. Directed by Stephen Fung (Tai Chi Zero, Tai Chi Hero), THE ADVENTURERS also stars Shu Qi (The Transporter, The Assassin) and Zhang Jingchu (Mission: Impossible - Rogue Nation). Bonus materials include a three-part Making-of featurette that highlights the talented cast. In this slick, high-stakes action-adventure, the world’s top thieves – the infamous and charismatic Cheung (Andy Lau), his former partner in crime, Xiao (Tony Yang), and beautiful chameleon Ye (Shu Qi) - join forces to pull off the heist of a lifetime. But when they find themselves pursued across Europe by a legendary French detective (Jean Reno), they’ll have to take their game to the next level.